Nikon D800E, 105mm equiv., f/2.0, 1/250s, ISO 400. Click here for the RAW file. In 2016, Nikon released a new 105mm f/1.4E prime lens, which proved to be a very popular and sought-after optic, offering an intriguing combination of focal length and a super-bright aperture. However, with a price eclipsing $2,000 USD, it is undoubtedly a great portrait lens, but one that is beyond the budget for many photographers. However, thankfully it is no longer the only 105mm f/1.4 lens available, as Sigma has released their own version, which is notably less expensive and also available for non-Nikon camera systems. While some cost has been shed, weight certainly hasn't been. The Sigma 105mm f/1.4 Art is a big, heavy lens. However, the weight won't matter that much after you view the sharpness this lens can produce, even wide open, and see its excellent bokeh! Let's take a closer look at the Sigma 105mm f/1.4 Art lens. First things first, when you see the Sigma 105mm f/1.4 Art lens, you realize that it is a beast of a lens. It has a huge 105mm front element and a maximum diameter of 4.56 inches (115.9 millimeters). It is 5.18 inches (131.5mm) long, as well. Honestly, even though it is visibly large, its weight still surprised me. The 105mm f/1.4 Art weighs 3.62 pounds (1.62 kilograms), which is a lot considering its length. It creates a front-heavy combination even on a large, gripped full-frame DSLR camera. When I paired it with the Nikon Z7 using an FTZ adapter, it felt particularly unbalanced. However, with its large size and weight comes excellent build quality. Constructed using a Thermally Stable Composite (TSC) along with traditional metals, the weather-sealed lens feels very solid. The lens has rubber sealing around the mount and includes a protective coating on the large front element. It is a pro-grade lens that looks and feels the part. Considering the size of the lens, you may wish to use it with a tripod. The Sigma 105mm ships with a removable, rotating Arca-type tripod foot that works really well. It's a good design and a welcome inclusion. The lens also has a very nice focusing ring, which has a ridged rubber grip surface and ample surface area, making manually focusing a pleasant experience. Overall, the Sigma 105mm f/1.4 Art lens feels good to use, but it is certainly large and heavy. Given its focal length and fast maximum aperture, it being a large lens is by no means a surprise, but it is still the case that it is not a lens you can easily pack away into a small bag. In many cases, a prime lens means you save some size and weight versus a zoom, but those typical advantages are not present in the Sigma 105mm f/1.4 Art lens. 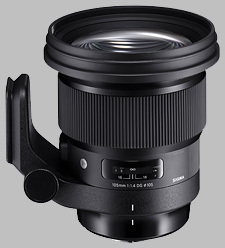 Including the large front element, the Sigma 105mm Art has 17 elements across a dozen groups. There are three F Low Dispersion (FLD) elements, two Special Low Dispersion (SLD) elements and one aspherical element to limit distortion and spherical aberrations. The front element is 105mm in diameter to improve peripheral illumination and reduce vignette. At f/1.4, the center of the frame is sharp. While the depth of field is razor thin, if something is in focus at f/1.4, it's sharp. You do lose a little sharpness toward the extreme edges of the frame, but that's very rarely a concern when shooting with a fast prime at its maximum aperture. By stopping down, you can resolve a bit more detail in the center of the frame and noticeably more in the corners, but sharpness is very good from f/1.4 through f/8. Diffraction sets in some at f/11 and is very apparent at the minimum aperture of f/16. Nikon D800E, 105mm equiv., f/1.4, 1/5000s, ISO 100. Sharpness test image. Full test scene. Click here for the RAW file. Sharpness test image. 100 percent crop. Click here for the RAW file. Nikon D800E, 105mm equiv., f/2.8, 1/2000s, ISO 100. Nikon D800E, 105mm equiv., f/5.6, 1/500s, ISO 100. Regarding vignette, the Sigma 105mm f/1.4 Art does display some vignetting at f/1.4, but it's minor and easily corrected. The first image below is uncorrected, ad the second uses the built-in lens profile for the Sigma 105mm f/1.4 in Adobe Camera Raw. As you can see, the issue is minor to begin with and can be fixed with a single click. Vignette test image without Adobe Camera Raw corrections enabled. Click here for the RAW file. Vignette test image with Adobe Camera Raw corrections enabled. Click here for the RAW file. Generally speaking, the bokeh performance from the Sigma 105mm f/1.4 Art lens is excellent. The camera does a very good job of rendering the out of focus area in the foreground and background in a pleasing way. Further, when shooting at or near f/1.4, the depth of field is very shallow, which will certainly be desirable at times. On the other hand, the very shallow depth of field can prove challenging in real-world situations. When photographing a portrait subject, for example, even the slightest movement between focus acquisition and moment of capture can lead to soft images. Further, it can be challenging to take full advantage of the lovely bokeh and also keep both of a subject's eyes in focus. Nikon Z7 with FTZ adapter, 105mm equiv., f/1.4, 1/125s, ISO 90. This image has been modified. Click here for the RAW file. Fortunately, the camera renders pleasing backgrounds even when stopped down to f/2.8 or f/4, which not only ensures that in focus areas are very sharp, but more of your image is in focus in general. On a less positive note, circular specular highlights are not kept round as you near the edge of the frame. This is not an unusual phenomenon, but it is still worth keeping in mind because in some cases, the "cats eye" effect can be a little distracting. However, looking at the positives again, some lenses can create odd bokeh with strange rings and unpleasant asymmetries, but the Sigma 105mm doesn't have this issue. Everything is smooth and soft, even if it does not stay perfectly round. Nikon D800E, 105mm equiv., f/1.4, 1/125s, ISO 3200. The nine-bladed aperture diaphragm does an excellent job of producing smooth, soft and natural-looking bokeh and transitions from in focus to out of focus. While on a full-frame camera, rounded out of focus elements can get a little jagged or oblong, everything out of focus stays buttery smooth. Nikon D800E, 105mm equiv., f/1.4, 1/250s, ISO 1400. Bokeh test image. Click here for the RAW file. In general, I was impressed by the overall control of chromatic aberrations. When shooting wide open or near wide open, there are some issues with CA in particularly challenging scenarios. In the image below, for example, the subject was very harshly-lit, and you can see some cyan and magenta aberrations around the lightest elements in the frame. In normal shooting situations, it was rarely an issue and when it was, it was not very noticeable. Further, it is generally simple to correct during post-processing. Nikon D800E, 105mm equiv., f/1.4, 1/2000s, ISO 100. Chromatic aberration test image. This image has been modified. Click here for the RAW file. 100 percent crop from the above image. Chromatic aberration test image. This image has been modified. Click here for the RAW file. When considering a fast portrait prime lens such as the Sigma 105mm f/1.4 Art, I'm sure that different photographers will have a variety of priorities. However, most photographers will care a lot about two things: how does the lens perform overall when shot wide open and how sharp are in-focus areas at fast apertures? To answer the first question, the lens performs very well. Vignette and chromatic aberrations are handled well, and the bokeh is some of the best I've seen. Regarding sharpness, the answer is a little bit more complicated because, especially at f/1.4, it is really hard to keep subjects in focus. If you can acquire and maintain focus at f/1.4, images are pretty darn sharp. They are very sharp as you stop down to f/2-f/5.6, as well. With that said, overall, the Sigma 105mm f/1.4 Art lens is a very good portrait prime. It has excellent optical performance overall with only a few minor issues, and these issues are more than offset by the overall performance. Nikon D800E, 105mm equiv., f/2.8, 1/250s, ISO 1400. 100 percent crop from the above image. This image has been modified. Click here for the RAW file. As I have mentioned throughout this Field Test, the Sigma 105mm f/1.4 is a really good lens. However, it also faces some distinct challenges. Its somewhat long focal length and very fast maximum aperture means that the depth of field in many shooting situations at f/1.4 is extremely shallow. A subject's eyelash could be in focus and the eye itself could be soft, for example. This is the nature of the optics and is something to keep in mind if you intend to take full advantage of the f/1.4 aperture. Further, this distinct combination of focal length and aperture means that the lens itself is very large and heavy, which introduces its own set of challenges with respect to shooting. It's not that easy to handhold for extended periods of time, and it takes up quite a bit of space in a camera bag. The Sigma 105mm f/1.4 has some large elements to move to acquire focus, and the margin of error is very small at f/1.4, so it is not too surprising that the lens is not blazing fast with its autofocusing. With that said, it still surprised me with its speed. The engineers at Sigma have optimized the lens' autofocus algorithm and implemented an integrated Hyper Sonic Motor (HSM) to help deliver quick and quiet autofocus, and I think they have done a great job overall. It's not a sports lens, and it isn't meant to be, but it focuses quickly. Nikon Z7 with FTZ adapter, 105mm equiv., f/1.4, 1/400s, ISO 1000. The close focus distance for the lens is 3.28 feet (1 meter). This is a maximum reproduction ratio of 1:8.3. This is fine for most portrait situations, but the lens is not well-suited for any sort of macro-style work, which is a shame given how sharp it is. This image was captured near the closest focusing distance of the Sigma 105mm f/1.4 Art lens. Nikon D500, 157mm equiv., f/9.0, 1/5s, ISO 100. Nikon D800E, 105mm equiv., f/2.5, 1/250s, ISO 100. Click here for the RAW file. This image was captured near the closest focusing distance of the Sigma 105mm f/1.4 Art lens. Nikon Z7 with FTZ adapter, 105mm equiv., f/8.0, 1s, ISO 100. Nikon Z7 with FTZ adapter, 105mm equiv., f/1.4, 1/125s, ISO 640. Nikon D800E, 105mm equiv., f/8.0, 1/80s, ISO 100. Nikon D800E, 105mm equiv., f/8.0, 1/60s, ISO 100. I was surprised at how versatile the Sigma 105mm f/1.4 Art lens proved to be in the field, being able to capture nice images in a wide array of situations. However, at the end of the day, it is primarily a lens meant for portraiture. The fast maximum aperture lets you very easily throw your background out of focus, and the bokeh performance from the lens is superb. However, this also means you can easily accidentally lose areas you wanted to be in focus. Further, this lens is heavy, and while more affordable than the Nikon 105mm f/1.4E lens, it is still expensive, with an MSRP of $1,600. If you need an f/1.4 aperture and want a 105mm focal length, it's hard to go wrong with the Sigma. The build quality and optical performance are excellent. At the end of the day, that's what matters most to those who would be interested in this lens. Nikon D800E, 105mm equiv., f/1.4, 1/250s, ISO 900. (From Sigma lens literature) SIGMA 105mm F1.4 DG HSM | Art: Introducing the "bokeh master" -- featuring incredible resolution and designed for full-frame sensors, this is the longest focal length of the Art line's F1.4 lenses. Since introducing its first SIGMA Global Vision F1.4 lens in 2012, the 35mm F1.4 DG HSM | Art, SIGMA has been adding wide-aperture F1.4 options to the lineup. Now, with the introduction of the new 105mm F1.4 DG HSM | Art, SIGMA offers a total of nine lenses with F1.4 brightness, including six for full-frame cameras and three for APS-C cameras. SIGMA has designed all of these lenses to offer minimal optical aberration and deliver incredible resolution and stunning contrast. Boasting the longest focal length of the F1.4 Art line lenses, the new lens combines outstanding resolution with a beautiful bokeh effect. Designed with great care to ensure that both the in-focus and out-of-focus areas of the photograph are equally satisfying to the eye, this lens is truly a "bokeh master." The SIGMA 105mm F1.4 DG HSM | Art has earned its place as the flagship of the F1.4 Art line lenses, prioritizing image quality above all to fulfill the promise of the line, delivering truly amazing optical performance. In order to combine outstanding wide-aperture, mid-telephoto performance with F1.4 brightness at maximum aperture, this lens incorporates 17 optical elements in 12 groups -- an uncommonly large number of elements for a prime lens. By including three FLD glass elements, two SLD glass elements, and one aspherical lens element, the optical system minimizes axial chromatic aberration to deliver extremely high resolution along with ample peripheral light volume. The area in focus is extremely sharp, while the area out of focus features a beautiful bokeh effect with highly natural colors, making this lens a powerful choice for portrait photography. The optical system also minimizes sagittal coma flare, making this lens excellent for capturing starry skies. 3. Professional specifications Like SIGMA's Sports line lenses, the 105mm F1.4 DG HSM | Art features a highly effective dust- and splash-proof structure with special sealing at the mount connection*, manual focus ring, cover connection, and other areas, allowing photographers to work in all types of weather. In addition, the front of the lens is protected by a water- and oil-repellent coating that makes cleaning easy. The high-speed, high-accuracy autofocus helps photographers react in an instant to get those special shots. * SIGMA mount lens does not include sealing, since sealing is present on compatible SIGMA cameras. The Sony E-mount version of this lens is compatible with Sony mirrorless cameras and contains the same optical system as the versions for other mounts. SIGMA MOUNT CONVERTER MC-11 is not required, as the lens performs the same functions as the converter, including in-camera image stabilization and in-camera lens aberration correction. In addition, the lens is compatible with Sony's Continuous AF, which is not available via MOUNT CONVERTER MC-11. SIGMA plans eventually to offer Sony E-mount versions of every full-frame prime lens currently available in the Art line, from 14mm to 135mm. Note: This product is developed, manufactured and sold based on the specifications of E-mount which was disclosed by Sony Corporation under the license agreement with SonyCorporation. *The operation of full-time MF may vary based on mount type. Launch: The Sigma 105mm F1.4 DG HSM Art lens will be available in Canon, Nikon and Sigma camera mounts in late June for $1,599.00 USD through authorized US dealers. L-Mount and Sony E-mount availability will be announced later. The Sigma 105mm f/1.4 DG HSM Art doesn't have any user reviews yet!